Michael Bryant, CPA, serves as Senior Vice President and Chief Financial Officer of NASBA and the NASBA Center for the Public Trust (CPT). Bryant works alongside fellow executive team members, ensuring the company’s strategies are executed successfully and its mission of supporting boards of accountancy is fulfilled. Bryant began his career with PriceWaterhouse and continued in public accounting for eight years. In 1990, he joined Genesco, Inc., where he served as Manager of Financial Reporting in the Corporate Accounting area. He joined NASBA in 1997 as Controller, became CFO in 2007, and Senior Vice President in 2012. Bryant is a member of the AICPA, the Tennessee Society of CPAs and has led stewardship drives and served as a finance committee member at his church. 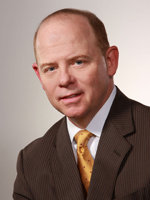 He also serves on the Board of Directors of the Nashville Chapter of Financial Executives Institute, International. He has performed improvisational comedy with various theater groups (including ImprovNashville and Music City Improv) and leads professional development classes based on principles of improvisational theatre. Bryant earned a Bachelor’s degree in Business Administration from Middle Tennessee State University and obtained his CPA license in 1982. He also holds a Master of Business Administration degree from the Owen Graduate School of Management at Vanderbilt University. A native Nashvillian, Bryant and his comedy-improvising wife Sheryl, currently reside in Brentwood, TN, with their two funny children.